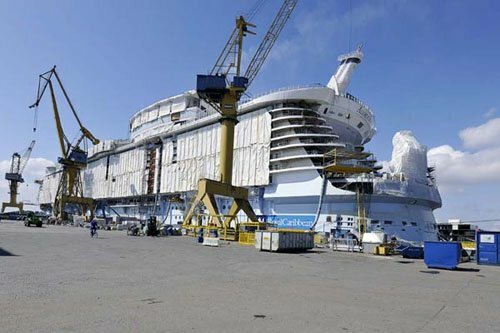 Royal Caribbean announced today it has signed a memorandum of understanding with STX France to build a fifth Oasis-class ship for delivery in the Spring of 2021. This order is contingent upon the completion of customary conditions, including documentation and financing. Final contracts, which include the definitive payment schedules, are expected to be completed within the quarter. Capacity increases for 2016 through 2020 remain unchanged. "The response to the arrival of Harmony of the Seas is staggering, eliciting excitement from eager cruisers from markets on both sides of the Atlantic," said Richard D. Fain, Chairman and CEO, Royal Caribbean Cruises Ltd.
"The Oasis-class ships have delivered beyond expectations each time," said Michael Bayley, President and CEO, Royal Caribbean International. "Harmony of the Seas' warm reception is evidence that growing this class of ship will continue to drive exceptional performance for the brand." "We are extremely pleased with the recent success of Harmony of the Seas and take great pride in our partnership with Royal Caribbean," said Laurent Castaing, Managing Director of STX France. "It is especially exciting to collaborate on such diverse projects from Oasis to Edge, both marvels in their own space." A fourth Oasis-class ship is also being built at STX France, with a delivery date of 2018.